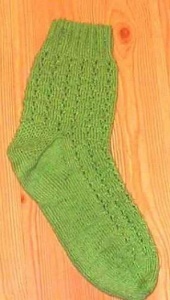 This is a very fun-easy eyelet socks to knit. The eyelets are made using yo’s and p2, tog. Give it a try am sure you will enjoy. Cast on 64 stitches dividing evenly among 4 needles using the 5th needle join in a ring being careful not to twist. Mark join as the beginning of the round and center of heel. Begin knitting K2, P2 ribbing for 2 inches. Lift running thread between the last stitch on needle number 4 and needle number 1 twist to avoid ahole. Knit one round even . Stitches on needle are divided thus:. (17, 16, 16, 16). Beginning with Needle 1 begin pattern stitch continue as established for 6 repeats ending with round 2. NOTE: With Marker in centre divide stitches so you have 32 sts on each needle break yarn beginning on right side of work start heel pattern. Row 3 K2, *slip 1, k1 repeat across from * until the last 2 stitches, k2. Knit in heel pattern until you have 32 heel flap rows. Heel flap shape should be close to square. End with a purl row. Knit to the center of the heel. Using a spare needle, knit across the remaining heel stitches. Pick up and knit 16 stitches from the side of the heel flap and knit one stitch in the gusset corner (Needle 1). Beginning with round 2, knit in pattern across needles 2 and 3 increasing 3 stitches evenly across these 2 needles only. With needle 4 pick up and knit one stitch in the gusset corner and then pick up and knit 16 stitches from the side of the heel flap. Knit the remaining heel stitches. Stitch count is (26, 17, 18, 26) respectively. Needle 2 and 3: Work in pattern on these 2 needles. Rnd 2: Work in pattern on needle 2 and 3 and in st. st. on needle 1 and 4. Repeat these 2 rounds until total stitches equal 67. (16, 17, 18, 16). Continue knitting in stockinette on needles 1 and 4 and in pattern on needles 2 and 3 until you are approximately 1 1/2 inches from the back of the heel ending with round 3 of pattern and decreasing 3 stitches evenly across instep stitches. Sock now measures 7 1/2 inches. Continue in this manner until you have approximately 24 stitches, repeat row 1 twice. There are now 16 sts remaining. Move 2nd stitch over 1st stitch and off each needle.